Something totally different from me, studio fans. Yes, a cat! 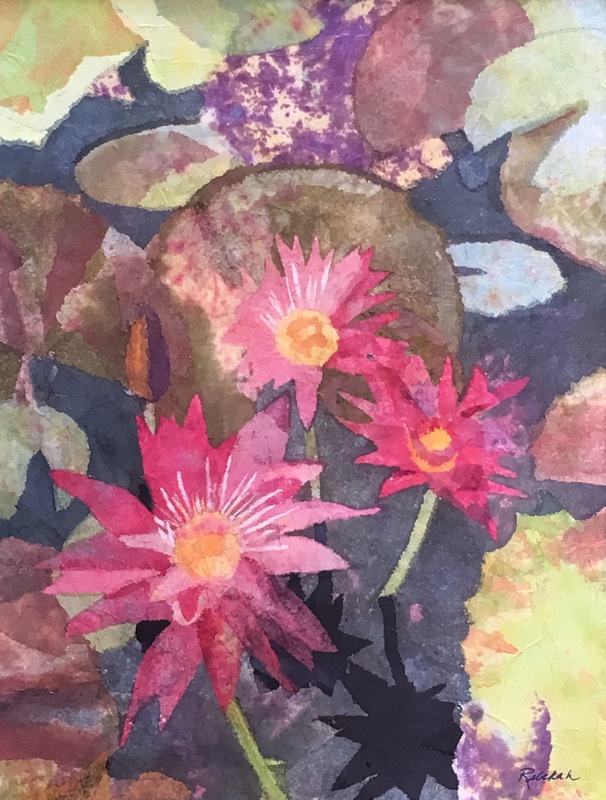 I created this piece with hand-dyed tissue paper and framed it just in time to offer it to the Punahou Carnival Art Gallery, open during Carnival hours 11 a.m. to 11 p.m. on February 5 and 6. Half of the sales collected is donated by the artists to the school’s financial aid fund. I love this kitty! Below are two more creations of mine that will be in the exhibit, too. 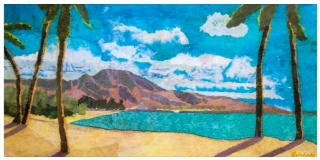 My high school classmate Wil, renovating his childhood home in Waialua, saw my art work and said he really liked the view of Mount Kaala from the war memorial at Haleiwa Beach Park and thought a painting of it would be nice. I knew almost exactly what he was referring to because I was reared in Wahiawa, situated on a plateau in the middle of Oahu, and “the beach” meant Haleiwa Beach on the North Shore. When my parents and I rode down through the sugar cane fields toward the ocean, we could see Waialua and Haleiwa in the distance. There were many a family picnic at Haleiwa, and my dad, a dump truck driver, often took me on his last run to Mokuleia to pick up a load of sand or rock , driving through Waialua. A few days ago I felt the piece was finished. DH thought it was my best. Really? It’s hard to critique my own work. It’s tempting to keep fussing, but an artist needs to know when to stop. Less is more. Especially when working with abstract shapes, tissue paper, glue, and a knife blade. Usually, I like to give the client the option of selecting a frame if I know they will be acquiring a painting. Anxious to apply the final varnish coat to “Mount Kaala from Haleiwa”, meaning no more changes or additions, and to take it to my framer, I phoned Wil.